We recently celebrated getting over our end-of-the-year viruses by taking a quick trip up to Astoria, which is about ½ hour north of Warrenton where I grew up. What a transformation that whole area has gone through – so prosperous looking, with the addition of several big box stores, and a major upgrade to the downtown area. It was great to see how lively the towns on the North coast looked. Still, there must be a number of residents that long for the quiet days when tourists and shoppers didn’t line the streets and life was much more private and secure. 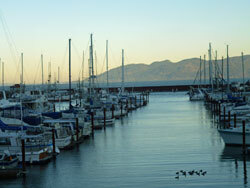 Mallards swimming in the peaceful Astoria boat harbor. Appreciating Gary Snyder's "The Wild Mushroom"
Poet Gary Snyder's "The Wild Mushroom" was carefully clipped from a newspaper many years ago by our dear friend, Paula, and tucked away in a trusted location for future reading. Now that Paula's leaving town, we inherited the clipping and have decided to share its delightful lines with you. 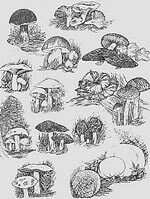 "The Wild Mushroom" was included in Mr. Snyder's 1974 Pulitzer Prize-winning volume of poetry, Turtle Island, and we believe it reflects both his Buddhist spirituality and his love of nature. As a poet, I hold the most archaic values on earth. They go back to the late Paleolithic: the fertility of the soil, the magic of animals, the power-vision in solitude, the terrifying initiation and rebirth; the love and ecstasy of the dance, the common work of the tribe. I try to hold both history and wilderness in mind, that my poems may approach the true measure of things and stand against the unbalance and ignorance of our times. I'm convinced that we mushroomers embrace Gary Snyder's values and hold them as truths in our own lives. Wouldn't you agree? 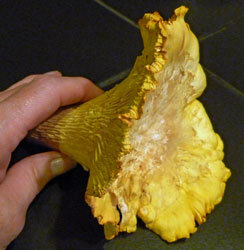 Our last foray of 2012 brought us a collection of quite large and firm golden chanterelles along with our first hedgehogs. What a nice way to end the year with mushrooms in our basket! Chanterelles, hedgehogs and cream are a perfect combination of flavors and textures when served over quickly sauteed chicken thighs and accompanied by steamed rice. This quick and easy dish makes an elegant and delicious entree for family and friends! Our last of 2012 chanterelles were quite large!